The 1890s were a gilded age of sports in America. Backed by the country’s moral and intellectual elite in the form of ministers and urban reformers, institutions like the YMCA were popularized, enforcing the rather novel idea of healthful recreation via organized sports. While this may seem obvious to us today, this was only decades after a time when watching people walk leisurely in circles for days on end was literally one of the most popular spectator sports in the world. But things were turning around in the sporting world. In 1891, basketball was invented as a safe way to keep track stars in shape in the winter. In 1892 professional American football got its start. A few years after that in 1895 a sport then known as Mintonette was developed, today better known as volleyball. The first modern World Series was less than a decade after that in 1903, as baseball continued its steady growth to becoming one of the most popular sports in the world. The following year Fédération Internationale de Football Association (FIFA) was formed in Paris to oversee competition between various international soccer leagues. Sandwiched between these was the Games of the I Olympiad in 1896- an international sporting experiment partially modeled after the Ancient Olympic Games, pitting amateur athletes from across the globe against one another. It should be noted here that the idea of amateurism was never a part of the Ancient Olympics. Some historians speculate that the notion was popularized by the British elite to maintain their dominance in sports over those who didn’t have the financial cushion to spend their days training. “Amateurism really started when the people who were rowing boats on the Thames for a living started beating all the rich British aristocrats,” historian Bill Mallon told Atlantic Magazine. On that note, when two British embassy servants, Edward Battell and Frank Keeping, tried to enter the 1896 Olympics in cycling, there was a push to get them banned for not being amateurs, with the bizarre reasoning being that, because they were not gentlemen, they should not be considered amateurs. This argument was thrown out, however, by the Greek organizers, who were not so elitist, and the two were allowed to compete. Back across the pond, the colleges that would eventually form the Ivy League are where most of the inaugural U.S. Olympic team was drawn from. Specifically, these first United States Olympic athletes comprised of a group of 14 men that primarily came from either Princeton University or the Boston Athletic Association, the latter consisting mostly of then current or former Harvard students, with the exception of one student from MIT, a student from Boston University, and a unique case in a 28-year old named James Connolly. What made Connolly somewhat different from the rest of the group was that he was one of 12 siblings born to poor Irish immigrants. Through his own hard work, he managed to be accepted to Harvard, albeit at a much later age than most of his peers. This was primarily owing to the fact that he worked through his high school years, rather than attending school. He would later remedy this gap in his education via self-study, culminating in his acceptance into Harvard. However, when he requested a leave of absence from Harvard to attend the Olympics, unlike the wealthy students, his request was denied, forcing him to quit school to go, which he did. Although upon returning he could have re-applied to Harvard, he chose not to try. Over a half century later, due to certain prestigious accomplishments he achieved throughout his lifetime, Connolly was offered an honorary doctorate by Harvard, but he refused it. After that, the pair gathered up their many guns (they weren’t sure what type would be used in the Olympics) and about 3,500 rounds of various ammunition, just in case, and headed to Athens to join their teammates in the first Olympiad. 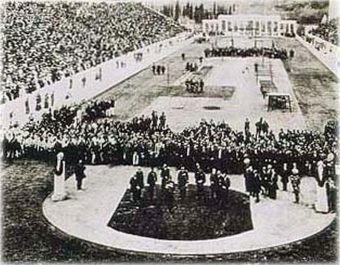 Baron Pierre de Coubertin, the architect of the Modern International Olympics, originally wanted to have the Olympics in his hometown of Paris, but the Greeks were enthusiastic enough about hosting the games that he was convinced to launch them in Athens. Coubertin’s decision was also strongly influenced by a Greek philanthropist who died in 1865. Evangelis Zappas had the same idea to revive the ancient Olympics as a national event, which he did briefly in 1859. Zappas died soon after but left his fortune to the creation of an Olympics that would be held every four years. Just as importantly, Zappas had refurbished the Panathenaic stadium from ancient times into a modern facility which helped connect the ancient and the modern. Still, despite the fact that crowds over 100,000 strong turned up to watch, the inaugural Athens Olympics was more of an experiment than a serious effort to bring the best athletes in the world to one set of competitions. As such, the overall performances at the first Games did not come anywhere close to approaching the world records for the various events. Further, the Games were staged on a shoestring budget, with many elements being improvised on the fly. The streets were thronged with people. There was a brass band welcoming us insistently, overwhelmingly. Banners – blue and gold for the Boston Athletic Association, orange and black for Princeton – were waving above the crowd. As if by magic, a procession formed. We found ourselves engulfed, marched away – we knew not whither; the quiet hotel became a distant dream. It was some building of governmental significance that we finally arrived. Our welcome was magnificent. There were speeches, cordial, we had no doubt, long, we were certain. There was champagne, much of it, and until we were able to explain the reason for our abstinence, international complications threatened. Training? What did that signify? A strange word. Come, a glass of wine, to pledge friendship. No? Very well, then, so be it. Strange people, these Americans! Yet they forgave us courteously enough. We had a welcome of the finest, and it was late indeed when we at last reached the haven of the Angleterre. The arrival of the American team instantly transformed the Olympic Games into a nearly global event. No longer were the Games a collection of Europeans but rather an event that went a long way toward fulfilling Baron de Coubertin’s vision of worldwide sport. Our first thought, of course, was to keep in good condition during the voyage, and to accomplish this we cast about us for the best means of getting our daily exercise. The captain, after a single glance at our spiked shoes, promptly forbade their use upon his much-prized decks. Yet rubber-soled shoes did nearly as well, and every afternoon we put on our running-clothes and practiced sprinting, hurdling and jumping on the lower deck. My own specialty, the high jump, was rendered especially interesting by the pitching and rolling of the vessel. It all depended upon whether you left the deck at the moment the vessel was bound up or down. If the deck was going up, about two feet was the limit which you might attain; if down, there came the glorious sensation of flying through space. A world’s record appeared to be surpassed with ease; and your only fear was of overstaying your time in the air, and landing, not upon the decks again, but in the wake astern. Arriving in Naples, the team took a train to Brindisi, then another boat to Patras, and finally booked a train to Athens. The trip lasted 17 days, though by a quirk of the calendar, they left on March 20th and arrived on March 24th. How? The United States, as with much of the Western world, was at this time using the Gregorian calendar, but Greece stuck with the Julian Calendar until 1923. As such, by the Gregorian calendar, these first international Games occurred from April 6th through the 15th; by the Julian Calendar, however, they occurred from March 25th through April 3rd. The American’s exhausting journey complete, the athletes arrived in Athens, as mentioned, to great fanfare, much to their surprise. Despite being given little chance to rest upon arrival, their performance at these Games ensured that the Olympic experiment would remain a “global” event going forward. On the first day, Americans Thomas Burke and Francis Lane won their heats of the 100 meter dash while Harvard dropout James Connolly won the triple jump and became the first Olympic champion in modern history. Shortly thereafter, Robert Garrett won the shot put. Remarkably, the aforementioned Paine brothers managed to win Gold and Silver in the 25 meter sharp shooting competitions with scores of 442 for John and 380 for Sumner vs. 205 points for the third place competitor, Nikolaos Morakis of Greece. In fact, the brothers were so dominate the first day that John decided to sit out the second to give his brother and other competitors a chance to win something. On the second day, Sumner dominated again to take gold in the 50 meter shooting competition. With their two victories in hand, the brothers sat out the other three shooting competitions to allow others the chance at the spotlight. In a similar show of sportsmanship, during the 100 kilometer cycle race, only two competitors actually ended up finishing owing to eight of the original ten dropping out before the halfway point; ultimately, one of the two remaining competitors, Greece’s Georgios Kolettis, had to stop to repair his bike. Rather than take the opportunity to secure a massive lead, the other competitor, France’s Léon Flameng, stopped as well and waited for Kolettis to finish his repairs before they both resumed racing. In the end, Flameng took home the gold with Kolettis finishing not far behind. All total the team of 14 Americans won 20 medals including 11 Gold, 7 Silver, and 2 Bronze. This was second in total medal count only to Greece’s couple hundred athletes who received 45 medals, comprising of 10 Gold, 16 Silver, and 19 Bronze. It should be noted here that the country one was from and the team to which said individual belonged was not nearly as emphasized as it is today in these first Games, at least not at the event itself; this is evidenced by the aforementioned fact that the Irish John Boland teamed up with the German Friedrich Traun in the tennis doubles competition. There was one exception to this overarching relative lack of team patriotism at the Games’ themselves and it was an event the American competitor, Arthur Blake, didn’t even manage to finish, dropping out at the 23 km mark, despite at the time being in third place. That event was the Marathon. Of course, 13 of the 17 racers in the Marathon were Greek, so they had good odds on victory. In the end, the marathon was one of the few events the Americans performed extremely poorly in, not even managing to complete it. Why is this so notable? Because when the Boston Athletics Association members returned home, they were determined to up their Association’s game in the sport and soon founded the then curiosity and now world famous Boston Marathon, an event still run by the Boston Athletics Association today. The American amateur sportsman should know that in going to Athens he is taking an expensive journey to a third-rate capital… where he will be devoured by fleas… and where, if he does win prizes, it will be an honour requiring explanation. However, once the small team began dominating on day one, the Boston Globe, the Boston Herald and the formerly naysaying New York Times carried headlines of the victories. Soon after, most newspapers in the country started giving daily coverage of the Games and the United States’ team’s progress, planting the seeds that would ensure the popularity of the Olympics in the United States going forward, helping the Olympics continue to be seen as an global event. Other Olympic games, held later, were to attract greater numbers of athletes, were to result in the making of more remarkable records; but for the time itself, nothing could equal this first revival. The flavor of the Athenian soil, the feeling of the helping to bridge the gap between old and new – the indefinable poetic charm of knowing oneself thus linked with the past, a successor to the heroic figures of old, the splendid sportsmanship of the whole affair. There is but one first time in everything, and that first time was gloriously and in a manner ever to be remembered the privilege of the American team of 1896.